The image of the Hagia Sophia always looms commanding and magnificent when one thinks of Istanbul but there is one other Byzantine church that also deserves just as much attention as her bigger, more famous sister, the Church of the St. Savoir in Chora. The magic about the Chora starts with its name, giving us a glimpse into a time and a city that was so far removed from what we know as Istanbul today. The name Chora comes from the Greek word Hora which has been translated as "land", "country" or "in the country," and in this case "outside the wall." 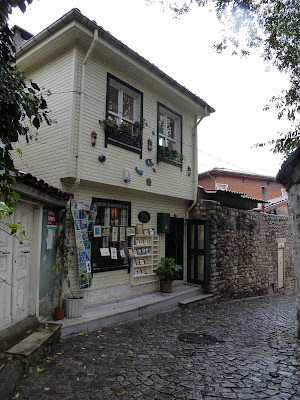 Although it is located inside the Land Walls built by Theodosius II in the 5th century, near Adrionople gate, the first church built on this spot was outside of the city walls Constantine established in 324, hence the name. 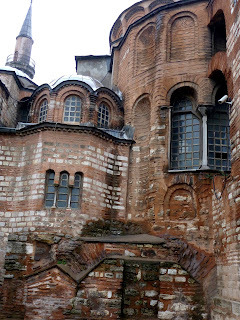 This was due to the ascetic lives lead by monks - at first monasteries would be built away from the city, outside of the city walls, a characteristic that would change in time as private, aristocratic houses in Constantinople would start to be turned into monasteries. Walking around the neighborhood surrounding Chora (Kariye Muzesi) today, with it's typical winding streets bordered with traditional Istanbul houses, artist's ateliers, gift shops and teahouses, it is really hard to imagine the monastery and church out in the middle of fields. 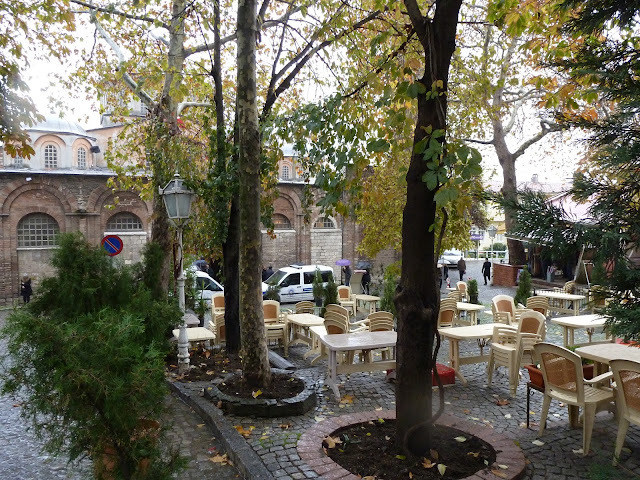 If anything there is a very Ottoman aura about the whole neighborhood. As hard as it is to visualize the urban landscape of 5th century Edirnekapi, as the area is known today, once inside the church, the visitor is treated to the splendid mosaics and spellbinding drama Byzantine churches were renowned for. 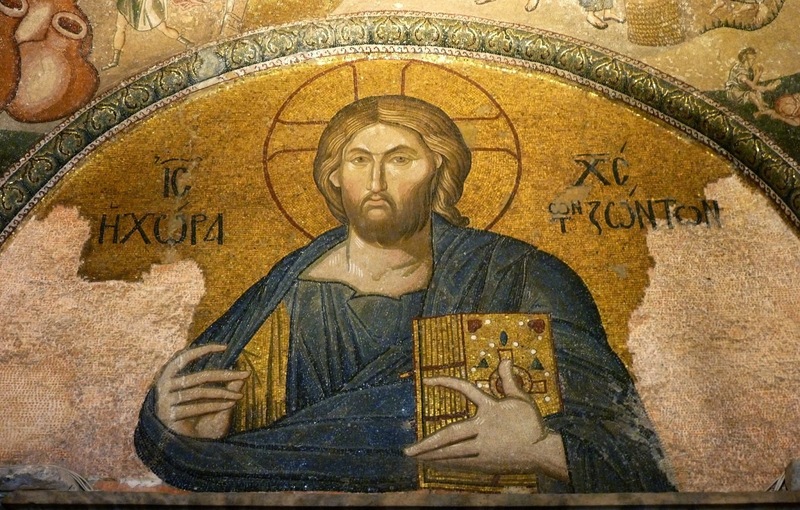 The Byzantine church was not just the space where the fateful congregated and worshiped their lord, it was a complete concept that incorporated the architecture, the iconographic program as well as the objects used as part of the liturgy, reinforcing the church as symbol of heaven on earth. the 24 grooves representing his ancestors beginning with Adam. 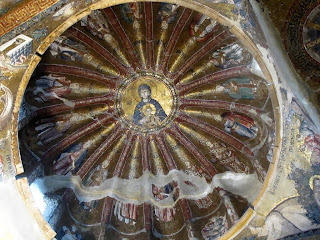 Inner Narthex Northern Dome, Geneology of the Virgin. 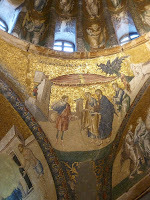 (photo Claus Kemp via Panoramio) Center medallion is Virgin as "the Mother of God"
Chora considered to be an archetype of its kind, is a cross-in-square church, a form of architecture that developed in the more egalitarian setting of monasteries.3 In this type of architectural space with its post-iconoclasm iconography, the dome became a shell for the depiction of icons and the believer in the church experiencing something akin to participating in the liturgy in heaven. 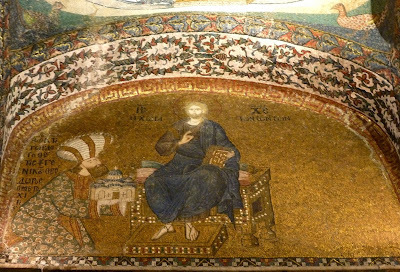 Christ Pantokrator is center top with a hierarchical progression of the apostles surrounding him and scenes from the life of Christ below them. 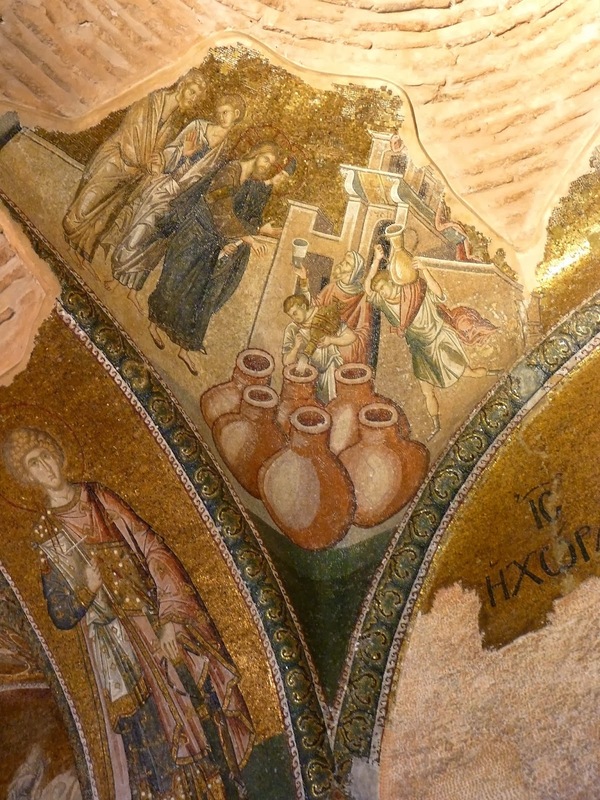 The mosaics on pendentives here show Christ performing miracles which continue on the arches. Today, even for those who are not of the Christian faith or even familiar with the gospels, the profound experience the Byzantine monks must have felt in this space is still evident. There is a heavenly aura that surround the individual as one makes their way through spaces filled with luxurious mosaics, variety of exquisite marble revetments, and golden depictions of the most sacred narratives from Christian history. 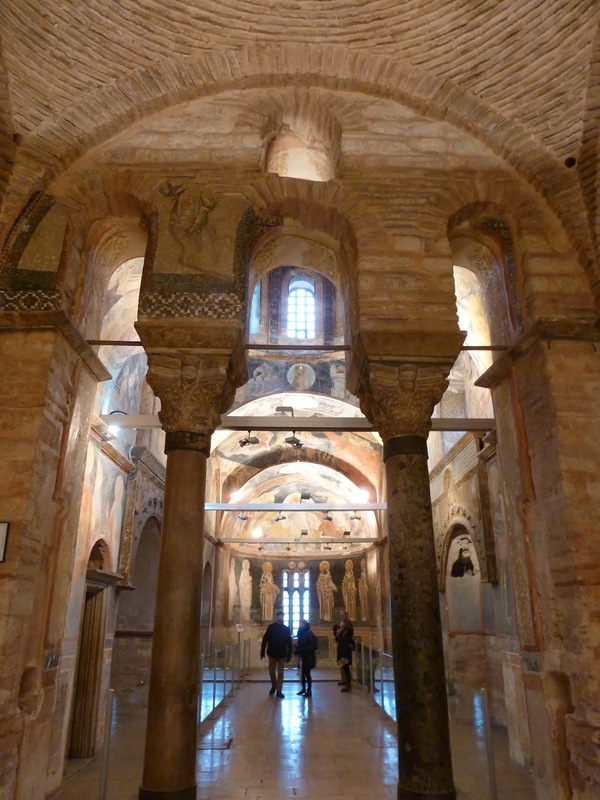 Chora museum, almost like a palimpsest, has been rebuilt and renovated several times over the centuries, different sections of the present structure attributed to different individuals, changing functions according to the changes taking place in the city. According to some historical sources and archaeological evidence it has been suggesteted that the first structure here was the monastery Justinian rebuilt (r. 527-565) that was destroyed in an earthquake. The present church bears the characteristics of the 11th and 14th century rebuildings and renovations. During the Komnenian period (1081-1185) Maria Doukaina, the mother-in-law of Emperor Alexios I Komnenos and later her grandson and the brother of Emperor John II Komnenos, Isaac Komnenos are attributed with making major renovations to the building, the most important of which seems to be the large apse replacing the earlier narrow apse and the raised, larger dome with broad arches that allowed for a more spacious interior. 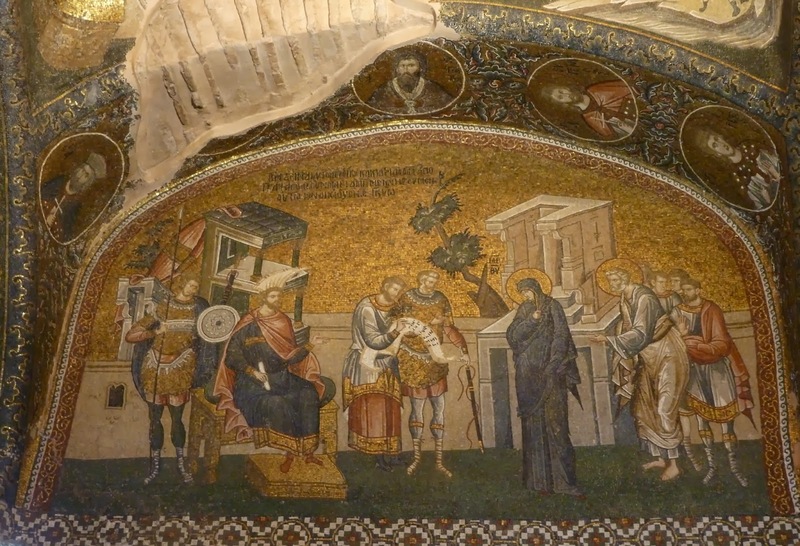 The magnificent mosaics and the frescoes in the parekklesion are all attributed to the 14th century reconstruction by the statesman Theodore Metochites who was appointed ktetor (founder) of the monastery by the Emperor Andronikos II Palaiologos. The most powerful man after the emperor, Metochites who described himself as statesman by day and scholar at night, was the first non-imperial founder of an imperial monastery.4 Considered to be the greatest scholar of his day, who wrote extensive poetry, Metochites is thought to have built the most important library of the Constantinople of the Palaiologian period which is why the depiction of the Four Hymnographers on the pendentives below the dome covering the western section of the parekklesion becomes more relevant. 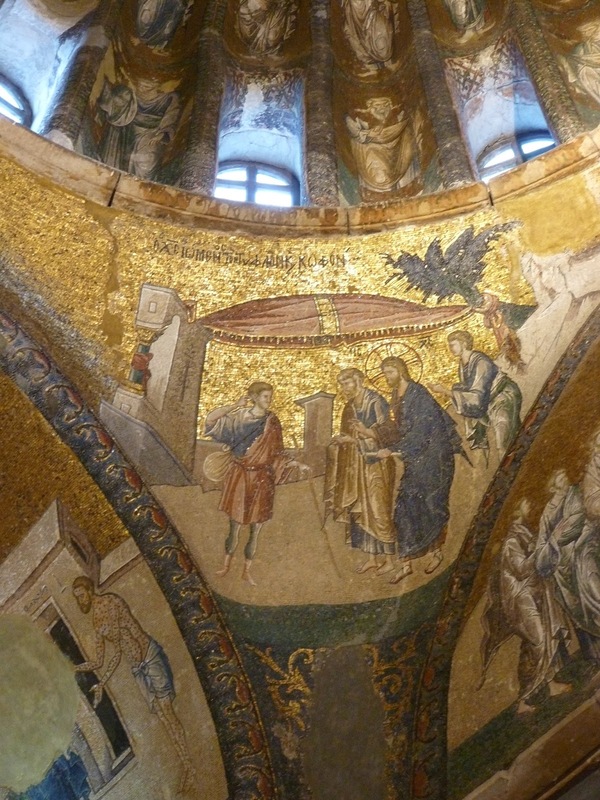 According to Metochites, the main purpose of the church's decoration program was "to relate, in mosaics and painting, how the Lord Himself became a mortal man on our behalf." 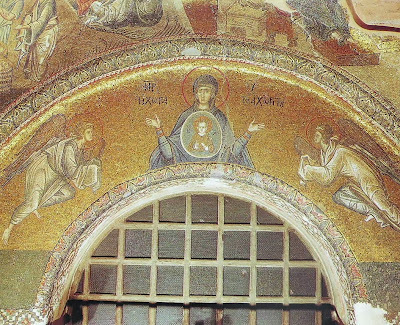 A distinguishing feature of the Chora from other contemporary churches was the inclusion of scenes from the life of Virgin Mary from the Apocryphal Gospels which were not included in the four Canonical Gospels. 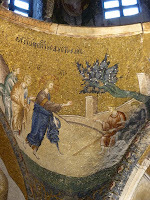 The mosaics with the cycle of Life of the Virgin include scenes not found in any other church like Mary receiving the Skein of Purple Wool and Enrolment for Taxation at Bethlehem. 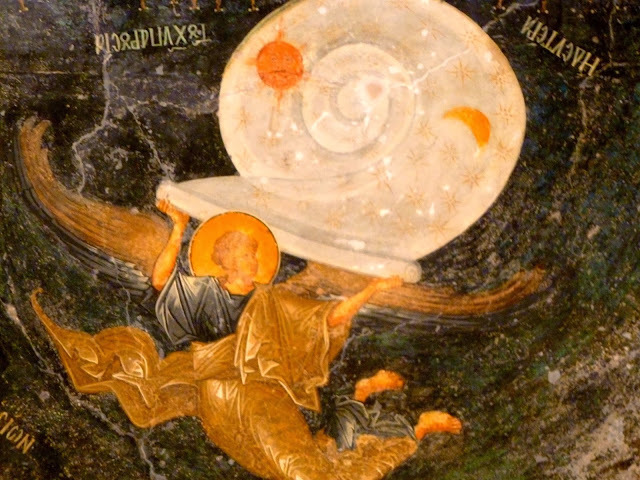 While the main church was dedicated to Christ, the monstery was dedicated to the Virgin Theotokos (GodBearer). The concept of Theotokos was at the root of the major controversy in the 5th century that concerned Constantinopolitans over if the Virgin Mary should be called "The Birthgiver of Christ" or "The Birthgiver of God"which was actually about the nature of Christ. Metochites played on this concept by having a mosaic above the entrance door that depicts the Virgin Mary with the Christ child placed as if he is in her womb, inscribed "The Mother of God, the dwelling place of the Uncontainable." Deesis mosaic in the inner narthex. 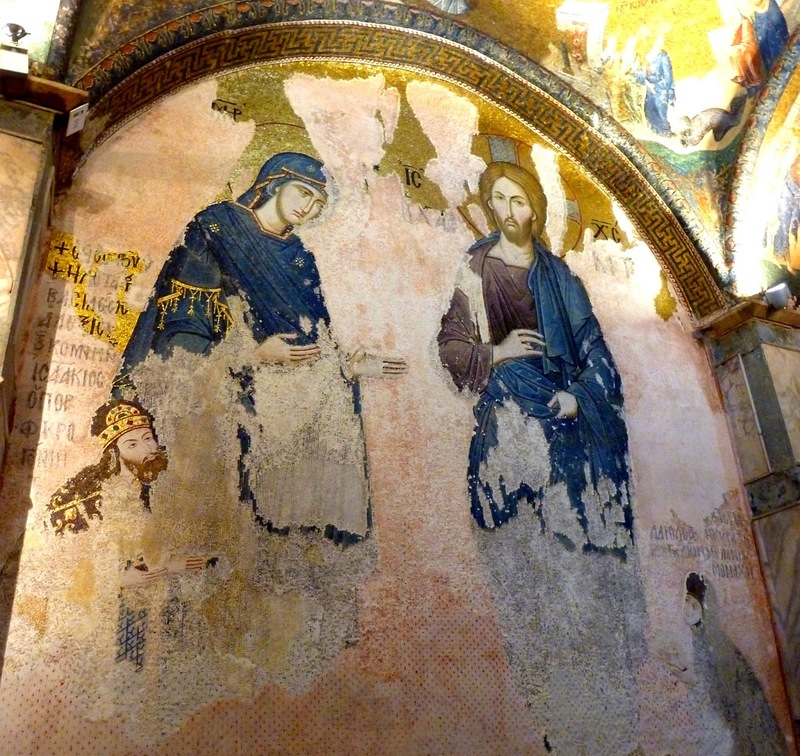 Prince Isaac Komnenos on the left of the Virgin and Princess Maria Palaiologos (Illegitamate daughter of Emperor Michael VIII Palaiologos) on the right of Christ. The parakklesion, a funerary chapel decorated with frescoes, was also added by Metochites. 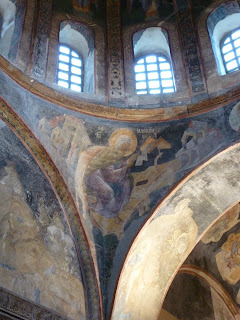 This part of the church with monumental frescoes including the Last Judgement, The Entry of the Elect into Paradise and the Anastasis also depicts the patriarchs and bishops of the Church dressed in their ecclesiastical attire. These figures can be identified by the inscriptions beside their heads but Saint Cyril of Alexandria (who was one of the most important protagonists of the Theotokos controversy) does not even need the inscription since he is identifiable due to his hooded costume. 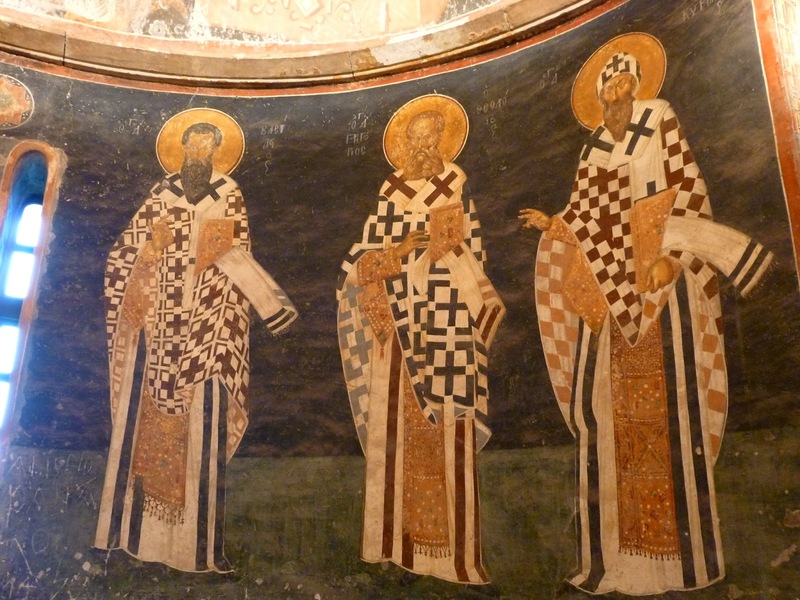 Metochites, who referred to the Chora as his sanctuary ended up being an actual prisoner there after he was ousted from power and exiled to Thrace for two years. He lived as a disallusioned monk for two more years before dying in 1332 and being burried in the parakklesion in a tomb he had prepared for himself. 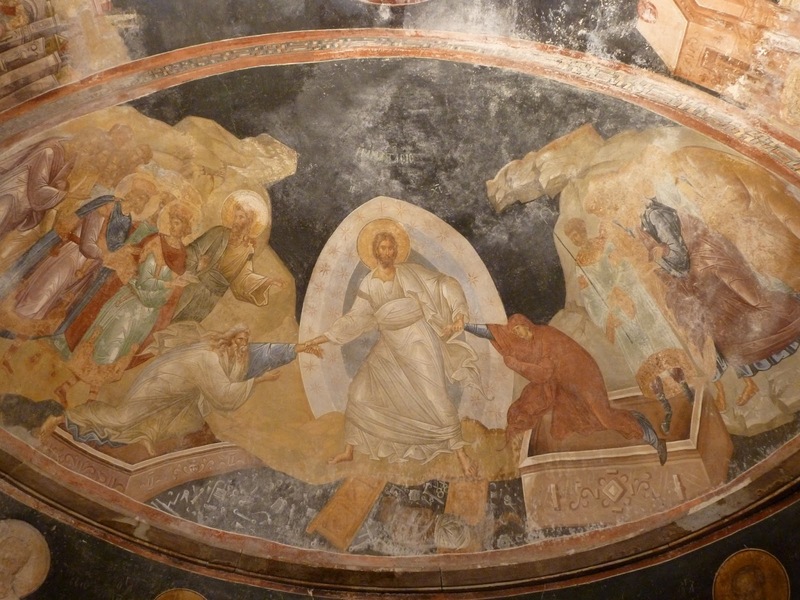 Chora's artistic program which was almost contemporaneous with Giotto's Arena Chapel in Padua is considered to be the pinacle of late Byzantine art. 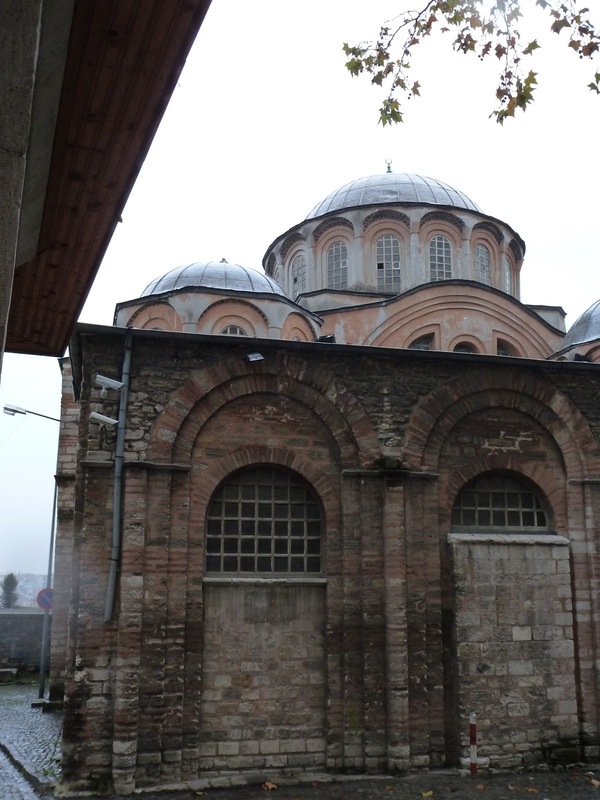 It is a project that showed originality and innovation compared to earlier Byzantine works while complying with the demands of Orthodox liturgy. Although it is possible to see an interest in depicting perspective in the decorations of the Chora monastery, the treatment of the spatial elements does vary from its quattrocento counterparts. Especially in one particular wall painting, of the last tomb monument made in the second quarter of the fifteenth century, the Renaissance style is clearly noted in the foreshortening of the throne Virgin Mary is sitting on as well as the foot stool, and the receding marble floor. Wall Painting of Tomb G with the deceased woman in the presence of the Virgin and Child. 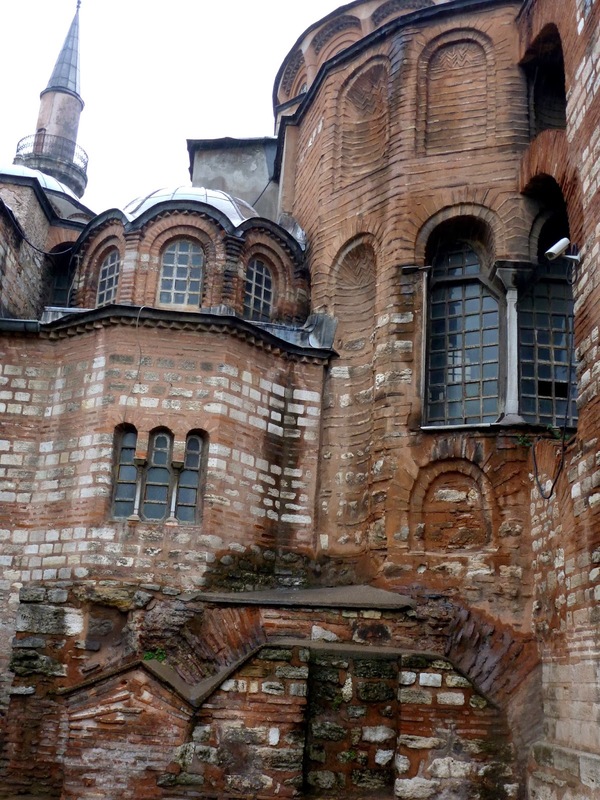 Chora church became very important after the Latin conquest due to its close location to the Blachernea palace which was being used instead of the Great Palace at this time. 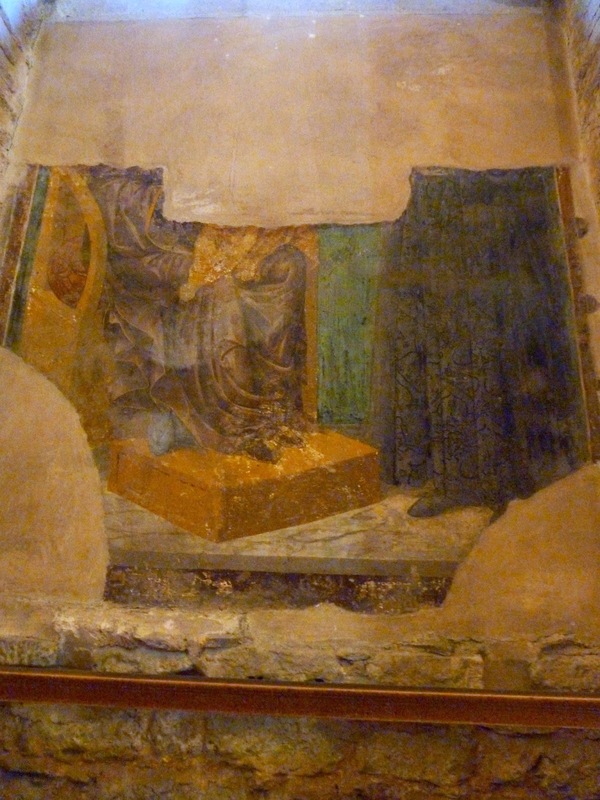 The protective icon of the Virgin that was supposedly painted by Saint Luke and taken out to be paraded along the walls to protect Constantinople was stored there as well. 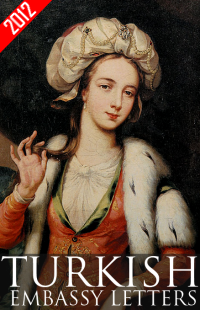 Several distinguished aristocrats and minor members of the imperial family were buried there. The many different layers of Chora fitted into one frame. The structure at the bottom is from the 6th century, the outer wall of the apse covering most of the right is from the 12th century reconstruction while the 14th century additions of the flying buttress can be idetified at the very edge of the picture on the right and the paracclesion on the very left edge of the photograph. Finally the minaret added sometime between 1495-1511 is at the top left. After the Turkish conquest in 1453, it was converted into a mosque with the addition of a mihrab in the main apse and replacing the belfry with a minaret and opened to worship, ensuring the continued survival of the building. 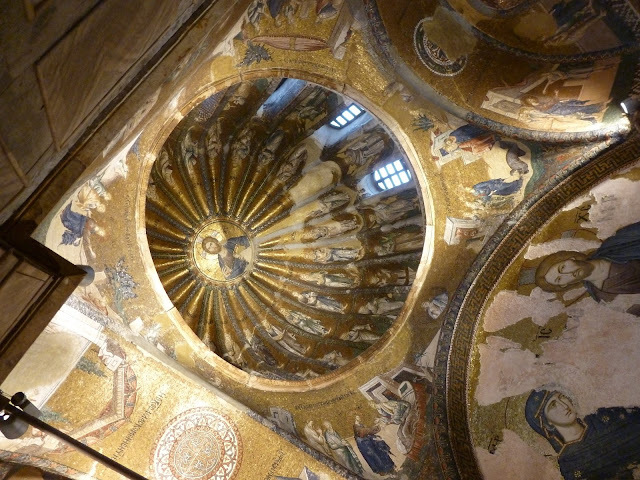 It is noted by European visitors to Istanbul that up until the 19th century the mosaics on the domes were still visible and the ones on the walls were covered by wooden doors which were opened by a guard to visitors interested in seeing the mosaics. 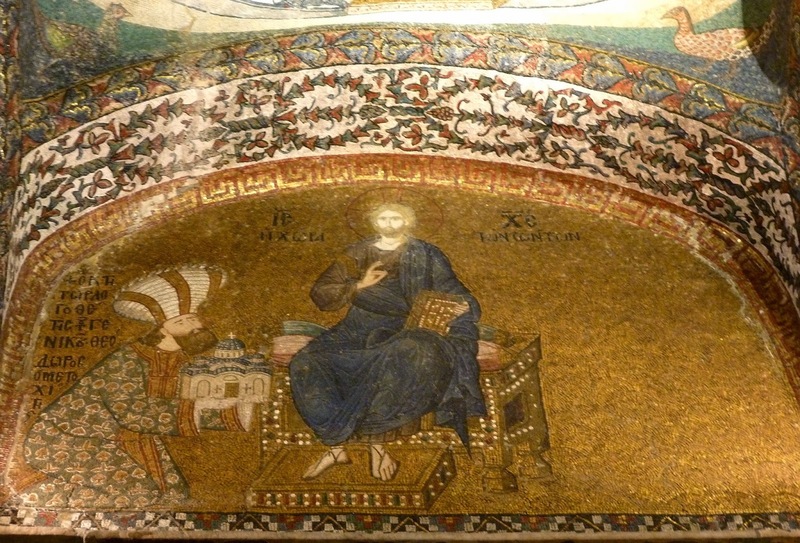 Christ Pantocrator, Mosaic above the door to the inner narthex. Note the irregularity of his ears; the modeling on the face and the disproportionate ears should be noted as the Byzantine artist's attempt at naturalism in mosaic that mirrors what their counterparts were doing with paint in western Europe. 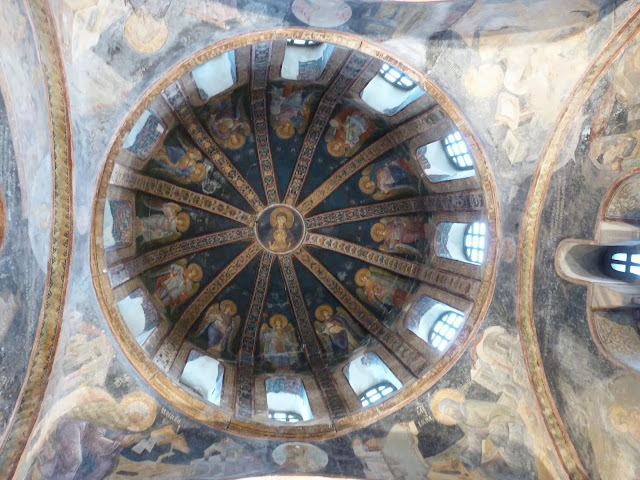 For those who cannot make it to Istanbul anytime soon, thanks to digital technologies, it is possible to take a step by step virtual tour from the Chora Museum official website. 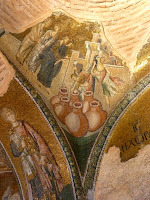 But my favorite and the definite recommendation is the Chora app from itunes which allows you to float around the different sections of the museum, understanding the spaces as they relate to each other as well as providing information on the fundamental details of the most important mosaics and frescoes. For more indepth information, history, images, plans, as well as 3-D animations, the website for an exhibit that took place at Colombia University, Miriam & Ira D. Wallach Art Gallery in 2004 Restoring Byzantium: The Kariye Camii in Istanbul and the Byzantine Institute Restoration is a great resource although I have not run across any book, website or blog that can encompass all of the lavish decorations and duplicate the wonder of being surrounded by it all - for that you would have to travel to Istanbul. 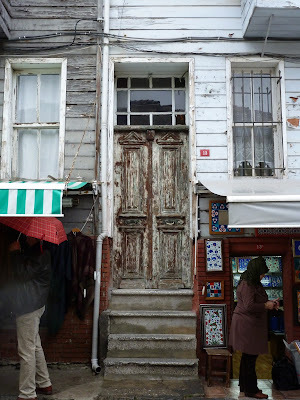 4 Robert Ousterhout, "The Kariye Camii, Introduction"
6 Robert Ousterhout, "The Kariye Camii, Introduction"
Wonderful post, Sedef! Visiting this church was one of the highlights of my trip to Istanbul a few years ago. I vaguely remember seeing "Mary Receiving the Wool with Purple Skein" when I was there, but I'd love to go back and pay more attention to that image next time. I didn't realize that imagery doesn't appear elsewhere! Monica, I really like your post! 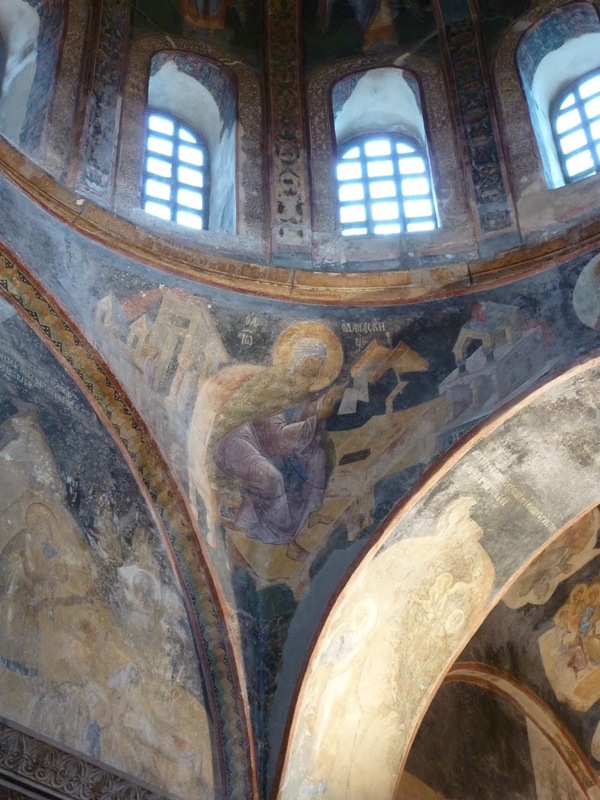 Yes the Anastasis fresco at the Chora is quite striking.There are so many details in the narrative scenes in the Chora that it is possible to write a separate post about each one.Thanks for sharing your thoughts.